All ASU students, both undergrad and grad, are welcome to apply to work in the Designing Health Lab. Whether you are a health (e.g. the School of Nutrition and Health Promotion), engineering (e.g., Fulton School of Engineering- Computer Science) , arts/design (e.g., Herberger Institute for Design and the Arts), or business student, we have a project that you could get involved in. We support students in conducting research for independent credit to support thesis work. Further, the lab is actively pursuing grant funding to support paid student work. Below is a list of projects that are being conducted as part of the Designing Health Lab. If you would like to get involved, please fill in the form at the bottom. As part of your response, please indicate the project that you would be interested in being a part of and any relevant work or class history you have to support you ability to work on the project. There are many possible ways that smartphones and other technologies can help people live healthier lives. Right now though, the current process for developing these strategies occurs in different silos and thus lessons learned in one place often doesn't get incorporated in other areas. The purpose of this project is to build a prototyping platform for smartphone-based behavior-change interventions such that we can foster a more rapid identification of best-practices for helping individuals be more active or sleep better. The long-term goal is to support other behaviors through this process. This project is in direct partnership with Bob Evans via his Paco system from Google. You will have the opportunity to help design interventions in a transdisciplinary team and to implement them. In addition, you will also have the opportunity to build a web page for participants to be recruited to be "beta testers" for this prototyping platform. There will be opportunities for back-end database development work as well as opportunities for fostering "big data" analyses from the work accomplished within the prototyping platform. For these students, compensation for work can occur via paid internships, research credit, or thesis work (e.g., Barrett Honors theses). In addition, students will also be given the opportunity to work with experts in industry via our corporate partners. Students will be able participate in designing behavior-change intervention ideas within the prototyping platform and developing unique work. New mHealth technologies (e.g., smartphones, cloud computing, wireless health sensors) provide capabilities for widely disseminated and personalized interventions that can adapt over time to an individual to give the "right" feedback at the "right" time and within the "right" context to promote behavior change but, at present, most mHealth interventions have not realized this goal. 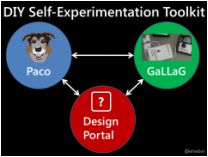 The purpose of this research is to develop and test a just-in-time adaptive intervention for increasing MVPA based on theory (i.e., operant conditioning & behavioral economics) and advanced engineering methods (i.e., system identification and control systems engineering) and delivered via mHealth technologies (i.e., smartphones, cloud computing, and wireless sensors). Collaborators: Eric Hekler (PI), Daniel Rivera (Co-PI), Matthew Buman, Abby King (Stanford), Sayali Phatak (PhD Student, Mentor, Hekler). Conducting literature reviews and interviews of likely users of the just-in-time smartphone apps for building just-in-time adaptive interventions. Designing and coding of components of the just-in-time adaptive physical activity smartphone app (design and/or programming knowledge preferred). Conducting user testings of prototypes of the smartphone apps(design and/or programming knowledge preferred). Using data gathered from this project to support undergraduate, honors, masters, or PhD theses/dissertations. While there is an explosion of smartphone apps and other technologies being developed that tell you strategies on how to live a healthier lifestyle or that try to persuade you to do the "right thing," few health interventions really help you to learn how to create behavior change solutions for yourself. In this work, we are exploring ways to simplify the process of creating health behavior change interventions to help individuals create their own technology-supported interventions. Specifically, we are developing a system that will allow individuals without any programming experience to create highly personalized interventions to help change behaviors they deem important to change, such as sitting too much, improving oral hygiene, or improved time management. To do this, we will provide individuals with all variety of highly customizeable technology support tools, such as a self-tracking smartphone app or home-based sensors and feedback, and create an overarching system and process for making the process of behavior change, personalizable, easy, and fun. Collaborators: Eric Hekler (PI), Jisoo Lee (PhD Student, Mentor, Hekler). Programming and supporting this research. Conducting user testings of prototypes . Exploring ways to evaluate the system. Join our team by filling out this application form!